I wish I could say I did mostly what Jack does all day this week but I was bad. Generally you should take at LEAST a full week to recover. However, marathon #4 is coming up three weeks after Montreal and I have two weeks (now one) left of training before attempting again to not almost fall flat on my face. Instead I used this as a transition week into one final week of training. Monday – I didn’t run but I did do 90 minutes of Bikram yoga to try to get some feel into my legs back. I think this was the most sore I felt after a race. Maybe I wasn’t up for the distance physically or mentally, whatever the excuse I could not touch my toes and do any move. Instead I took my time, gently going as far as I can for each position. Tuesday – It took about 1.5 days before my mind and legs starting craving the run. So in the evening I took a very casual shake out 5 mile run on the flattest part I could find near my house. 2.5 Miles one way and 2.5 returning on the same path because there’s just not enough flat well lit areas near me. Approximately 45 minutes and I was done afterwards. Wednesday – Time for “real” running, so I took a runch of 6.5 miles on the treadmill incline 2 (I still wasn’t ready for my usual 3). It took me about 56 minutes which is probably 3 minutes longer than usual and I felt pretty trained afterwards. Thursday – Double Duty runs! 7 miles in the morning at a dragging pace in 59 minutes. 6.1 miles in the evening in about 52 minutes. Most of the evenings splits were around 8:15 pace and total time included some work emails. Running and writing emails and trying not to crack my skull on the pavement is hard work! Friday – It dawned on me that I haven’t taken a rest day yet unless you count my Bikram session. I decided to listen to my burned out body and rest, eat tacos, have some beer and enjoy the important things in life.. like tequila shots. Saturday – 22.2 miles They got done and that’s the important part. I can write a whole post on this but I’ll save it for another time. So short story.. I ran on the Minuteman Bikepath in Arlington which round trip was about 17 miles. 17 happy miles on not worrying about cars, trucks, and uneven sidewalks that I normally do. Those 17 miles flew by as I realized I was somehow keeping a pace of 8:10 that went up to 8:15 towards the end. That pace for 17 miles didn’t even feel straining, it felt comfortable! Then once I stepped of the trail, my legs decides to pay dead. I got a ride to the path but coming home I was on my own. There was 5 miles between me and my home and my mind wanted nothing to do with it. Problem is once your mind decides it wants to salivate over pizza instead of your run, your legs go down. I wanted food, and warmth and the gels were not doing anything for me. Either way through some hilly and flat parts, and some mile count downs I eventually made my way home exhausted and drained but happy the run was done. Sunday – I probably should have rested but I got so excited when I saw the sun that I couldn’t miss out on the run. Somehow 8 miles just went by and I watched a beautiful fall sunset! So this past weekend I was in Montreal. Sunday I was preoccupied with a little run. Friday I arrived after midnight so that left Saturday to sink in all of Montreal. I love Montreal, from the little cafes, to the French that I don’t understand a word of, to random Art Nouveau details on the buildings to the crazy staircases on the brownstones. However in the past I always travel with a group of friends or family so walking was limited. Saturday I was on my own (with Tony) and walked my legs out literally. We started with brunch at a cafe located at the edge of Mont Royal neighborhood, a sorta hipster meets Jewish neighborhood. Tony got eggs benny and I stayed boring with a cup of coffee and stealing his food. I had a granola bar before we decided to get breakfast and was a little too full. All the plates were that big and around $15. Although a little pricey, the waitress gave me no trouble for not ordering anything besides liquid black gold. Other truth why I didn’t order anything? I had my heart set on a deep fried roll with red bean paste from Chinatown. The race expo was about 3 miles away and I took the opportunity to walk there. I met Walle on my way. I also walked by this sorta interesting front on St. Laurent. I then wondered over into Old Montreal. I got one picture before it started to rain. Normally the place has a killer line but due to the rain we only had to wait 10 minutes for a seat. One smoked meat sandwich and nash for me. What is a nash? Pepperoni stick. The sandwich was yummy. Two little pieces of rye bread, a little bit of mustard and lots of meat! I don’t normally eat a lot of meat but I guess when I do, I eat a ton. I highly recommend a visit if your neighborhood severely lacks a good Jewish deli. After Schwartz we walked back to our AirBnB (another 3 miles or more) to rest for an hour only to walk back downtown and check out Old Montreal at night! Notre Dame Church in all it’s nightly glory! We did take the Metro back at which I realized it was about 10PM, I’m hungry and I should eat something. I also wondered if maybe walking around for 20 miles all day wasn’t that smart before the marathon. However, it was all worth it! Have you ever been to Montreal? What you do/see? Ever have the Montreal bagel? We had one the last time I was in Montreal, only problem is we had like 4 of them because we did a bagel crawl. Marathon Oasis & ½ Marathon de Montréal, part of the Rock ‘n’ Roll Marathon Series took place September 23, 2012. The day had a marathon, a half marathon, a 10K, a 5K and 1 mile. I think between the 5 races there was up to 40,000 people and as far as I know all races sold out before September started. The marathon and half marathon started at one location while the 10K and down started at the 20 mile mark before the finish line. The race fee for the marathon ranged from $90-$150 depending on when you signed up. I used a coupon code around February and signed up for $60. I think out of the all race expos I’ve been to this was the least exciting one. The number and shirts pick up was quick and easy and I went around noon on Saturday. The swag bag? Completely empty. Not even a crappy weird tuna sample like in Providence. Maybe other countries aren’t as wasteful as Americans are? Nope because as I made my way down the expo, I literally had fliers and papers pushed at me. The expo was set up in a snake path that forced you to go through the whole thing back and forth. I gave up on the expo after I had to find the bathrooms and was too lazy to walk through the whole damn expo all over again. The best and worst part of it all was the Brook’s section. normally I find fun and cool was creepy with this tortured looking lizard thing. Poor lizard. On the good side, I got my running gait analyzed and found out I’m a neutral runner! No wonder chunky shoes always hurt my knees. This was my 3rd marathon and was unlike the other two. I woke up at 7:11, got dressed, ate half a pita that tasted a whole lot better 12 hours ago then it did that morning. I was also craving peanut butter like a fiend and bread just didn’t taste the same without it. 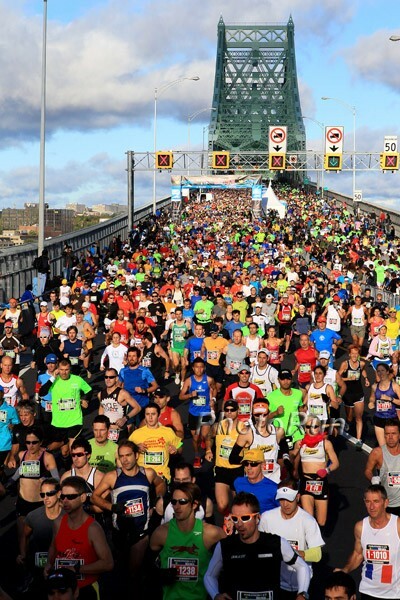 The race started at the Jacques-Cartier Bridge, a very large and industrial bridge. We left our lodging at 7:30 to try to drive up closer to the starting line. I felt hungry and my legs felt stiff from walking up hills streets for 12 hours the day before. Turns out that the start of the path up the bridge started a block off from where we were staying. So after driving around for 20 minutes we were back where we started. Brilliance. I had a mini panic when I thought I had to walk 3KM (almost 2 miles) to the race start. Luckily I think it was only about a mile walk over the bridge. While walking and worrying I chatted up a few runners. 8:30 came and I was in my corral with a need to pee. Of course they only had one porta per corral of about 1,000 anxious paranoid runners. I gave up on being able to pee and decided to trust my ability to hold it in. 8:30, still no start time as a delay was announced. Suddenly I started to panic as I thought about the 30,000 thousand runners on a bridge that I was keenly aware was suddenly shaking. Luckily within 5 minutes the official race started! By 8:40 my corral, #3 was off! I don’t have any idea what my splits were being the sad garminless runner (whose birthday is coming up in 2 months cough coughtonycough) that I am. Because I was in Canada I couldn’t use Runnerkeeper like I normally do (stupid AT&T and their ridiculous international data rates). Instead my recap and mile by mile replay will be based on my whininess factor. Miles 1-4 Within the first mile I knew this race was going to be tough. This run was going to be hard and I’m going to regret every step I took the day before. Every race that I started before I started with a strong kick. I haven’t learned how to start slow and finish fast so I go all out. My first mile was around 8 minutes and I guess my negative feels predetermined how my race went. The first 4 miles were also incredibly boring and packed even from corral 3. I felt stuck in a pack that I couldn’t get around. The first part of the race was on Île Ste-Hélène and around the perimeter of La Rhonde, a bunch of rollercoasters operated by Six Flags. Running around in repetitive looks of broken concrete and mud got boring real fast. Miles 5-7 We finally moved to a new little island where we did more repetitive loops. There was a cool track where I think F1 racing might take place and running that part was fun. I guess this island compared to the first 4 miles was slightly more fun but still super crowded. Miles 8-10 were somewhere industrial. Really RnR? If I wanted to run through industrial waste runs I could do that in my own neighborhood and it would be free…. Where’s Montreal? Where;s my scenic route! I was starting to get cranky and with that my legs sped up and I felt revived. Miles 10-13 Around Mile 10 was when we finally hit Old Montreal and was probably the best mile of the race! It was also the mile that I realized 20 MPH winds were blowing against me and that might be why as hard I pushed my legs seemed to not be going as fast as I’m used to. I spent a good deal of mile 12 and 13 debating on whether I should call it quits and just end the race at the half point. After all 1:45 half marathon was still respectable. I debated and debated and as I passed the 13 mile I didn’t make the turn to the finish line. Miles 14-16 were probably the worst miles of the whole race. I regretted, desperately regretted not calling it quits at the half way point. I also didn’t want to walk another marathon like I did at Boston. My mind screamed at itself in regret. The wind was going crazy, and my muscles were twitching at every point. I regretted not wearing my usually Asics for shoes. (Long story short, I forgot that all my shoes were old and crappy so I wore a pair of chunky Saucony I won in a raffle that felt like clown shoes and were rubbing my feet the wrong way.) I regretted not eating enough before the race start. I regretted walking around. Mile 14-16 had a lot of walking. A few people were giving out bananas and I took a few to try to fill up my stomach. Mile 17-22 I went back to running around what I think might have been 8:30 min pace. I guess the walking rested my legs a bit so i could run again. I think the wind wasn’t going completely against me so that helped as well. There was a GU station around mile 20 and I grabbed a strawberry banana one that didn’t completely make me want to vomit. Mile 23-26 I went back to running 1KM walking 1 minute. I loved having the KM signs all over the place to break up my running! I also remembered around mile 23 that I still really need to pee! Could my bladder survive a 5k? I thought not so I stopped by a portapotty only to be greeted by a sight I don’t want my eyes to see again (I still don’t know how you could explode all over the seat and I hope to never find out). So I kept on running, what’s another 3 miles on a full bladder anyways. Mile 26-26.2 I thought I had about half a KM to run when I saw the finish line (I guess the markers were a little bit off). At this point I gave off a strong kick as I sprinted past 5 people to the finish line! After finishing, I was so grateful that I didn’t quit at the halfway point. I guess within seconds amnesia took over all the pain I felt for the past 26 miles. The angry wind against my face. The rolling hills miles 13-16. The lack of scenery for the first 10 miles. None of that mattered because I was finally done. I finished something I was doubting for the past 4 hours if I was capable off. After you finish the race they gave you all your post race food in a bag which I loved. There was a banana, a small apple, some muffin thing and some orange electrolyte drink. They were also giving out yogurt that I bypassed. After I grabbed my medal and food I headed over to the Michelob Ultra tent to get my free booze and hoped Tony would find me there since neither of us had a phone we could use. (I don’t know how people survived before cell phones!) I ended up not even opening my beer but instead opted for a hot mocha instead. I was freezing! The winds were still going as it and I couldn’t find a constant patch of grass with sun in it. I’m not really sure I would recommend the full or half marathon to anyone. I found the first 10 miles not really worth the race fee. It was packed, repetitive, and industrial. The second half of the race was more residential but similarly repetitive as we went out and back. Even for the half marathon I would say this was my least favorite route that I have run. However, what the race lacked in scenery it made up in crowd support. The crowd was amazing! The local people really came out and cheered! Also because our race numbers had our names on it, I would hear them cheer “Liana! Go Liana! Don’t give up.” Or at least that’s what I thought they were saying since it was in French and only part I understood was my name. Here’s the problem.. Taper week = less running; less running = free time to reload weather.com = freak out over all the clouds and showers I am seeing forecasted for the weekend! None the less I am packing and owing Tony favors (chicken parm dinner) for making the 11 hour driving commute. What am I packing? I’m not sure, after a summer of 90 degrees, I’m not really sure I remember how to run in 55 degree wet weather. Extra socks? Check! Wait how will I carry them? Nathan belt check! Have I ever ran with it or even ripped off the tag since I ordered it a year ago? Nah, but hey no time to test new gear like a marathon (not). Calf sleeves? Check.. I don’t think it’s tights weather yet but I think I might be a bit nippy in just a skirt. Light long sleeve shirt in case weather goes below 50. Now I just worry and worry…. Wednesday – 5 mile run with some cool cats like Robin and Katie in conjunction with Reebok and Citysports training run for the Tufts 10K. Robin has been my running idol from back when I first joined DailyMile at the beginning of the year with her 20 mile treadmill runs. We kept it nice and easy at approx 9 minute pace. Weather was pretty much amazing! Flat outside evening run, how I missed you. So Friday and Saturday will be my off days as I study this pace chart and try to assure myself that rain will only make me run faster! I have a few battle goals in my mind and I think I’ll be okay if I reach any of them. Most of all I hope it doesn’t rain the whole weekend because Montreal is one of my favorite cities and I can’t wait to visit it again! As mentioned before we had a wedding at the Cape this weekend and decided to spend a little bit of Sunday exploring. We stayed at the Blue Dolphin Inn which was a very basic low budget motel. But worry not because low budget motels will still cost plenty at the Cape because your only other option for shelter is your car. Anyways although a ton of food was consumed at the wedding we still woke up starving! I blame the 22 miler from the day before and I don’t know what Tony’s excuse is. Anyways after much debate and search of Yelp, we picked Brewster Coffee Shop, a perky local favorite brunch spot. I usually am a boring brunch girl with either an egg white veggie omelette or pancakes but today I wanted something extra greasy. So I ordered the eggs benedict with corn beef hash. It was soo good. And then we shared because the only thing better than a brunch, is 2 brunch dishes! I’ve been begging Tony to take me biking at the Cape for weeks and no such luck. Since we didn’t have our bikes and less than two hours of free time, we decided to walk some of the Cape Code National Seashore. Our first nature walk was the Nauset Marsh Trail along some wetlands with little fishes about 1.2 miles or so round trip. The second trail was Fort Hill trail with a nice overlook and an easy 1 mile loop. As for the wedding? It was beautiful! But I will refrain from exposing my friends all over the interwebs without their permission. Instead I will share the cutest cake top ever! You can bet if I ever have a wedding Mr. Meower will be our flower boy. I clean up well even if I do look a little tired after being up for 22 miles on my feet and then 4 hours in 4 inch heels. And a food picture because there’s nothing better than a filet mignon and swordfish steak after some Cape Cod Clam Chowder. I’ve been a part of some very tasty weddings this summer! Have you ever been to Cape Cod? Which part? Have you ever bike the Cape Cod Rail Trail? Saturday was my 4th and final 20 miler before RnR Montreal. I am excited and I am praying for no rain. I want a perfect, flat easy race. Dear running gods, please listen and keep the rain away. Speaking of rain, on Saturday I woke up at 8AM to the sound of pouring rain and a 20 miler on my schedule. We were going out of town for the night and the last thing I wanted was to stress out on how to run 20 milers in unfamiliar territory that would probably involve driving. So i went to bed early Friday due to exhaustion and a need to finish 20 miles by noon. The weather was not the only obstacle in my Saturday. Starting with the morning my stomach was not happy with me (runners love TMI). Friday has been filled with way too much eggplant parm (yay for free food and leftovers at work) and a day of eating Munchkins. It was angry! So at 8:30 I wondered if I really needed that 4th 20 miler. I almost went back upstairs and to bed. However, something told me to go eat breakfast and just see how things go. Two peanut butter soaked rice cakes later the rain was down to a drizzle and I decided to take my odds with the weather. Maybe the odds are ever in my favor. I’m glad I stuck it through because despite what was predicted to be a nightmare run turned into a dream one. The rain that happened in the morning cooled off the air to mid 60s and the clouds lingered about protecting me from the heating sun. Miles 1-3 – I was cautious and paranoid never knowing if my stomach was still angry or if I will be okay. I took it slowly as I wasn’t sure how my legs would feel. I took Friday off but sometimes they just have a will of their own. Miles 4-7 – I was a little faster but still careful as you never want to burn yourself out too early in the day. Mile 15 – I stopped to check my mileage and I think that’s when my mental wall came. Suddenly I slowed down. Suddenly although my legs felt good I thought I needed a break. I got paranoid I was dehydrated and lopped back to my house. Miles 16-18 – I ran back home on a downhill and trying to keep myself excited. I had my average pace at that time around 8:05. Stopped by the house for 5 minutes for water and stretching. Miles 19-22.2 – My sheer joy of running was gone and I began to counting down the miles until the end. I was looping and trying to avoid any major hills which is a bit tough in my area as I ran boring circles down some of the more flat blocks. 22.2 Miles – 3 hrs 10 minutes! 8:33 pace with the break but 8:17 average pace of actual running. Chipotle’s Chicken salad. I know it doesn’t look quite as exciting as their burrito but that’s what boyfriend’s food is for. I just steal a few bites from Tony, he doesn’t need to eat the whole thing anyways 😉 I don’t usually advocate fast food for recovery but we had a wedding to get to and no time for a cooking. As bad as I felt starting out this run, it turned out great in the end. I feel great in my ability to finish the race. I don’t think I will PR or BQ but I think I can comfortably run a 3:45 and that is all I want. I heard there are pacers and I might try to keep up with the 3:30 group but if need it be I will drop back. I’m running Amica marathon in Newport THREE weeks afterwards and I think that will be the race I will go all out for and hope for a PR. It’s not as flat but I do think I need more tempo long runs to break 3:24 PR. I’m going to see if stronger faster running will compensate for less weekly mileage then when I first trained for USA Marathon back in March. When I trained for my first marathon I was hitting 60-70 miles in the final training weeks but I was also working only 40 hours vs up to 60 that I will have coming up for the next month. Therefore this will be an experiment. If not, there’s always next spring to PR ;). What do you think works better for marathon training? More miles on your feet or faster tempo runs with less weekly mileage? Hi there, I know it’s been a while. Three days is a lot for me! I’m alive and busy but still running. Big news… well not really… but I signed up for the Boston Marathon and am all approved and paid for! My heart screams redemption awaits! Although if I had to bet, I think it will snow this coming year during Marathon Monday to mess with me. Sure I have a marathon the following week but I guess I’ll worry about that later. Speaking of marathon. RnR Montreal is coming up! This week I’m up to 31 miles so far and will cap off tomorrow to 35 leaving the big 20 for the weekend. Then I once again I pretend to taper. The plan is to try to rough it out with the 3:30 pace group but I’m not sure that I can handle that. Tuesday – 6AM alarm I was not a fan but a girl gotta do what a working girl who runs marathons gotta do. 6:10 and I am out the door in all my groggy glory. This was my first time running in Malden on a week day morning. Even the sun has barely awaken and my mind wondered why I was racing the rising sun. A few other people are outside walking their dog, but runners? Sadly I am a lone warrior. I push to wake myself up with random neighborhood loops and stayed on mild rolling hills. I didn’t know if I want to go fast or easy as each leg felt a different way. End up at 7 miles, 57 minutes 8:12 pace. Wednesday – 6AM? Well hello there, I remember. Much easier. Went on a bigger loop this time as both my legs agreed it was time to run fast. 7 miles ending in 55:30 with a 7:55 pace! But wait, I came back in the evening after work for a 7PM, 7 miler! 63:30 9:05 pace this time but to be fair it was on a treadmill set at incline 3. 14 miles in the books even if it’s in bits and pieces. Thursday – 6AM? NO! Snooze and back to bed for an extra hour of restless sleep. My reflex overtook my running addiction. So I figured after a week of no runches, it was time for one. 6 miles, 50 minutes, set at incline 2 8:23 pace and one sweaty gross mess later I felt at ease. Later tonight I continued with 8PM 4 miler at an easy 8:46 in 35 minutes. And now we’re here. Other things I’ve been doing? Reading The Long Run: A New York City Firefighter’s Triumphant Comeback from Crash Victim to Elite Athlete and the chapter I read this week was about 9/11 and I was tearing up on my morning commute. I’ll have a full review when I finish the book eventually. Author Run To MunchPosted on September 13, 2012 Categories runningLeave a comment on Catch up Thursday!